Thank you for the wedding attire you provided for our wedding on 19th June. All our guests commented on how lovely we all looked and how fantastic my dress was and how smart and co-ordinated the whole party looked! The service and advice you gave to us all was excellent. 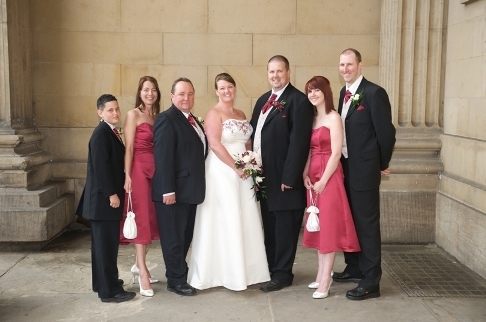 Bride's dress is 'Donna' with cranberry trim. Bridesmaids are D295 in cranberry. Groom and boy in black Prince Edwards suits from the hire range. We just want to say thank you for providing us with our suits and dresses. We have really appreciated the good service you provide. I would like to thank you for the hire of my wedding dress. I really enjoyed wearing it. It looked and fitted exactly how I wanted it to. It really was my dream dress. Thank you for all your help with the wedding dress for my wedding on 4th March. The day was absolutely brilliant and couldn't have been better. The dress was beautiful and I received lots of comments about it. Thanks again.